Of the two standard lengths of britches, plus-fours are more traditional than plus-twos (the number indicating how many inches below the knee they fall). Four inches gives you more room to move; it is more practical and more suitable to actual physical use. Plus twos are a more recent invention. They have less fullness through the leg and obviously finish shorter, which is a look some customers prefer. Plus fours are mostly used for hunting these days. I’m not sure exactly how many we make a year, but it is fewer than 20. The other problem, of course, is that they last very well and are often used irregularly. So customers don’t tend to have many pairs. One gentleman does have a few though, which he likes “to wear around the house” as he says. He has them in tartan and in Thornton tweed. And he likes to use them for skiing, lined with Gore-Tex. They’ve always been very practical clothes, designed for active use, so I suppose it’s nice to see them being used in that manner. All britches use Velcro to fasten today. Originally they would have been fastened with a button, and for a while they were elastic. But Velcro works very well. It is easy and quick to undo, which is valuable when you have boots, socks and garters all around that area. Plus it is never uncomfortable up against those other items of clothing. 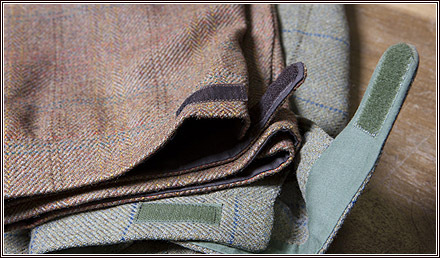 Plus fours are not particularly hard to cut, but they do require attention as to how you build in the right amount of fullness through the leg and then below the knee, so they come back and fasten correctly underneath the knee.